Unfortunately, in the world of financial advice, titles don’t always mean what they seem. Someone could call themselves a financial advisor, and have no qualifications or education at all. Another person could call themselves a financial advisor, and have CFA® and CFP® designations, plus a Master’s degree in Finance. Finding a financial advisor who will act in the client’s best interest is confusing, and truly a “buyer beware” scenario. Unless you are well-versed in the various business models, it can be hard to tell advisors apart. The red flags aren’t always obvious. 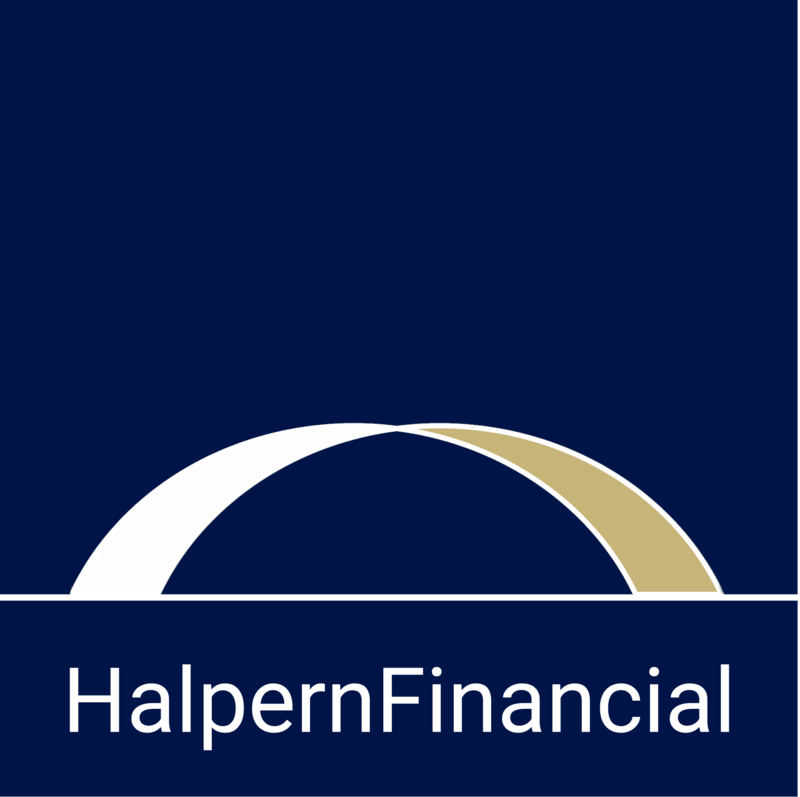 This has been on our minds lately at Halpern Financial, because one of our clients received a shady insurance pitch masquerading as a “tax-free investment opportunity.” In reality, it was a loan against an insurance policy with very high annual premiums—a loan that would have to be paid back eventually. There were so many things wrong with this pitch—primarily, how misleading it would be to someone without financial expertise, the potential “tax bomb” that comes with this type of strategy, and most importantly--the advice was nowhere near the best interest of the client. We had to find out more. So we sent a secret agent from Halpern Financial to an event of the firm that provided this advice. Partially for entertainment purposes, and partially to see how this sales pitch was presented to the public. Was their information accurate at all? And most importantly, what were the red flags an average financial consumer might not notice? 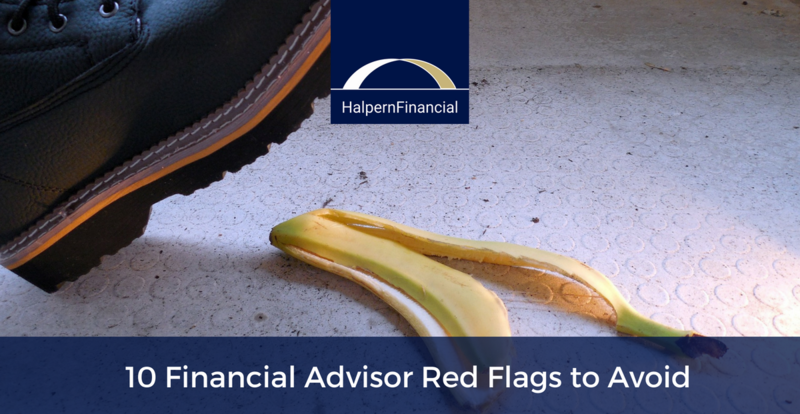 Financial Advisor Red Flag #1: Not qualified. This seems like a big red flag, doesn’t it? Yet many people are not sure how to do the proper due diligence to find out whether an advisor is trained to give the advice they promise. FINRA BrokerCheck. Fee-based advisors and insurance/annuity salespeople are governed by FINRA. Use the FINRA BrokerCheck tool to investigate their history and qualifications. SEC Investment Adviser Public Disclosure website. Use this tool for due diligence on fee-only Registered Investment Advisory firms. CFP Board. Certified Financial Planner professionals are all listed in the CFP Board’s database so you can verify credentials. During our “covert ops,” we found an extreme example of negligence in this area. Although the person who made the insurance pitch advertised himself as an expert in comprehensive financial planning, including estate planning, retirement income strategies, and tax planning, he had no certifications or licenses in these areas. His LinkedIn resume said he was a Certified Financial Planner® professional with Certified Life Underwriter and Chartered Financial Consultant designations through The American College. When we went through the due diligence steps, we found none of this was true. Essentially, this person had put out a shingle saying “Get your financial advice here” without any qualifications, or any formal protections for his clients. Financial Advisor Red Flag #2: Commission-based. The commission-based, product-centric business model is dying off, as investors realize the negative impact that high sales charges and transaction costs can have. Furthermore, a commission-based structure introduces a conflict of interest—an advisor could select investments based on which ones pay big commissions, not which ones are in the client’s best interest. A fee-only model is much more in line with clients’ interests because the advisor has no incentive to push one brand of products over another—the only incentive is to do what is best for the client. A euphemism for a commission-based structure is “We only get paid when you do business with us.” Do not be fooled by this and ask for a detailed explanation of payment structure. Financial Advisor Red Flag #3: Fee-based. The terms used to differentiate various advisor business models are confusing. Fee-only means that the client is ONLY charged a fee for advice. Fee-based means the client is charged a fee for advice plus commissions for buying and selling securities or other products. Advisors who are “dual-registered” to sell securities and insurance are fee-based. Financial Advisor Red Flag #4: Focusing on fear. The entire focus of financial and investment planning should be the client’s individual goals. If the conversation focuses largely on fear, you should ask why. Are you being sold a product intended to protect against loss (ie. an insurance policy being presented as an investment)? This was exactly the approach taken in the presentation our secret agent attended. Insisting that “market performance isn’t what it used to be,” the presenter showed a chart of market returns from 1970-2000. As you can see, it looks like it goes straight up, with average annual returns of 14.02%. Then he showed a chart of market returns from 2000-2016—it looks a lot scarier and more volatile. Average annual returns were far below the long-term average. But remember: equities exchange short-term volatility for long term growth, so we should expect a more volatile chart for shorter time periods! It makes no sense to compare a 30-year timeframe to a 16-year timeframe for equities. Just take a look at the entire period from 1970 to the present day. Total annual return, including dividends, for this period is 13,025%, which breaks down to average annual returns of 10.87%. While of course returns suffered due to the outliers of the dotcom bust in the early 2000s and financial crisis in 2008, in just a few short years markets have gone back to normal double-digit averages. 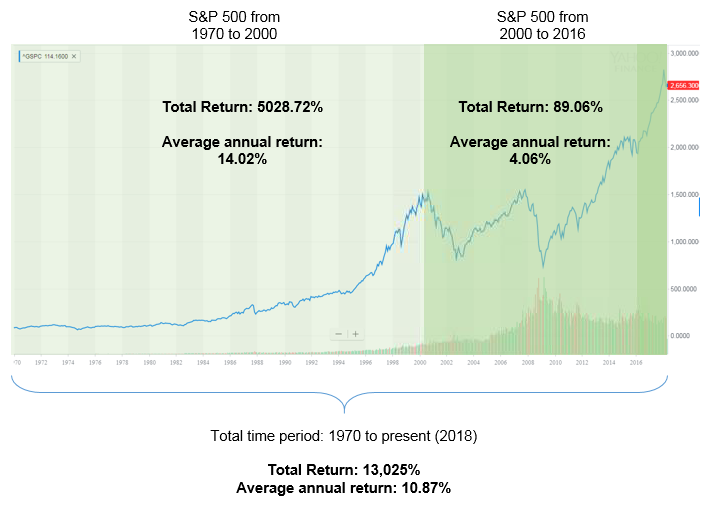 The value of long term returns still holds true. Financial Advisor Red Flag #5: Promotes insurance as an investment. Do you consider your car insurance an investment? It’s something you pay every year and hope you never use. Life insurance should be the same. It’s intended for protection, not growth. It is a very cost-inefficient way to achieve growth compared to low-cost index funds. Financial Advisor ABC, Inc. is independently owned and operated, and offers its own suite of products and services entirely independent of Broker-Dealer XYZ. Certain individuals associated with Financial Advisor ABC, Inc. are registered with and offer securities and investment advisory services through Broker-Dealer XYZ, Inc., a registered broker-dealer and investment adviser, member FINRA/SIPC. If you see this on an advisor’s website or business card, be aware (and possibly beware). The mention of a broker-dealer and the fact that securities are provided through a separate entity are telltale signs of a fee-based advisor selling commissioned products. Financial Advisor Red Flag #7: Tied to a broker, bank or insurer. Often, advisors tied to these organizations may be pressured to promote the broker, bank or insurer’s products over others—even if it doesn’t perfectly fit the client’s situation. In some cases, they may not have access to a broad variety of investments, and may be limited to a small approved list. An independent financial advisor has access to funds from any fund provider, and can recommend a portfolio best suited to your needs. Financial Advisor Red Flag #8: Uses testimonials. This is strictly forbidden under the compliance rules for Registered Investment Advisory firms. If someone has testimonials on their website, it means they are not under SEC or FINRA governance. While it is technically legal to give financial advice without being licensed, why would you knowingly choose an advisor who chooses to skirt the industry standards? Financial Advisor Red Flag #9: Bogus awards. There are many, many pay-to-play award schemes out there. In fact Halpern Financial often receives emails saying “Congratulations, you have been chosen as a top advisor in Obscure Magazine No One Has Ever Heard Of! Claim your award by buying our $149.99 commemorative plaque!” No thank you. Always look into the awards and accolades advertised on an advisor’s website to learn about how winners are chosen. Awards decided by a peer vote or by objective standards of quality will always mean more than the ones anyone can buy. Other awards are legitimate, but may be based on standards that don’t mean much for you as a consumer. For example, “Top Advisor” awards in certain leading financial publications are based on the size of the firm (in terms of assets under management). This simply tells you which firms are the largest—not which ones have the best client service. Financial Advisor Red Flag #10: No evidence of fiduciary standard. A fiduciary advisor should be able to tell you, in writing, exactly how they act in their clients’ best interest at all times. (For example: cost- and tax-efficient strategy, access to institutional funds, working with all professionals in a client’s life to ensure a coordinated strategy, and paid only by the client directly.) Vague platitudes about caring for clients don’t cut it. We hope this list and the details of our covert mission help you to sift the wheat from the chaff when it comes to finding a fee-only, fiduciary wealth advisor. In this piece we’ve covered all of the ways NOT to find this type of advisor—but you may also want to check out our guide on all the things you SHOULD look for when hiring a financial advisor.